muffins are one of my favorite foods these days. i love that they make for a quick, portable breakfast, an easy snack, or even (if served with a bit of ice cream or yogurt), a delicious dessert. while my favorite types of muffins are admittedly ones overflowing with chocolate or nutella, i try my best to eat slightly healthier than that most days. 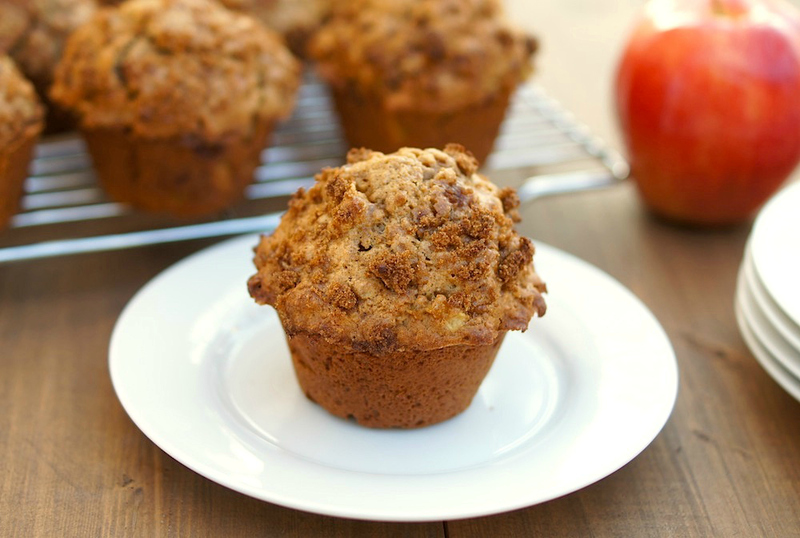 and these whole wheat apple muffins are absolutely scrumptious, with far less “guilt” than the dessert-type muffins I normally go for. the recipe comes from vegetarian blogger (real-life friend) lesley eats – i’ve had a lot of success with her recipes, so i was confident that these would turn out deliciously. and you know what? they did! 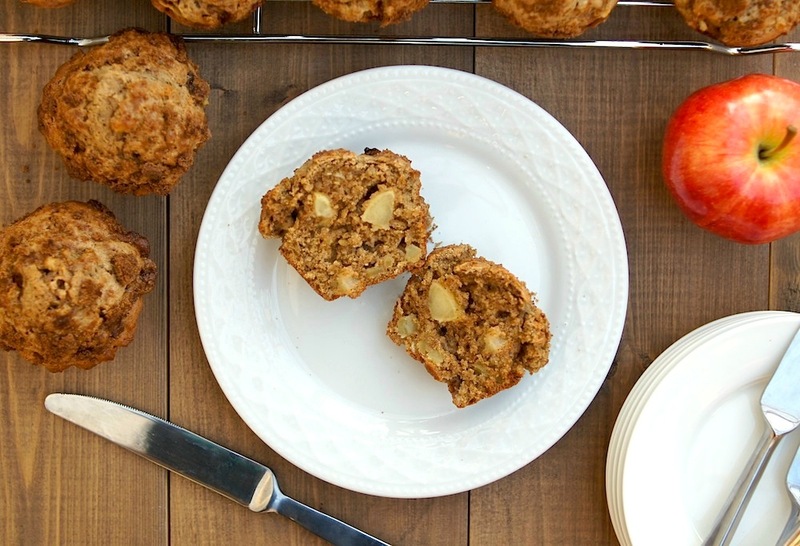 these muffins are wonderfully light, with a slightly sweet cinnamon-apple flavor, and a delightful bit of texture + heft from the apples + oats. oh, + the brown sugar topping? it bakes up wonderfully sweet + crunchy – soooo addictive. i’ve been eating at least 1 muffin a day since I baked them, which means I’m already down to my last few muffins. looks like it’s time to make another batch! 2 large apples, peeled, cored, + chopped into small cubes (about 2 to 2 1/2 heaping cups), preferably Honeycrisps, Fujis or Galas – I used Galas. preheat the oven to 450°F. grease + flour the cups of a muffin tin (or use muffin cup liners) + set aside. mix together the flours, oats, baking powder, baking soda, salt, allspice + cinnamon, + set aside. in a separate bowl, cream the butter + sugars until fluffy. add the egg + mix well. add the milk + vanilla + mix again. then add the dry ingredients, mix + fold in the apple chunks with a spatula (by hand). divide the batter evenly among the prepared muffin cups, filling to the top of the cup, sprinkling the remaining 1/4 cup brown sugar on top (about 1 teaspoon per muffin). bake for 10 minutes, turn the heat down to 400°F, + bake for an additional 5 – 7 minutes, or until a toothpick inserted into the center of a muffin comes out clean. cool the muffins for 5 minutes in the tin, then remove them to a wire rack to cool completely. I’ve really been meaning to get back into a habit of pre-cooking my breakfast staples. Lately, I’ve been on a Luna Bar kick, which is “ok,” but not sustainable moving forward. I think this post definitely has me motivated to get back into my groove! These look extra yummy, btw. I’d love to see more breakfast ideas! These look awesome. I love the extra brown sugar on the top! Yay! Love the whole wheat thing. I think these are the tallest muffins I’ve ever seen. That’s pretty neat! I always have a problem with that when I make whole wheat muffins. Mine are usually tasty but always flat as can be. I’ll have to try your recipe!